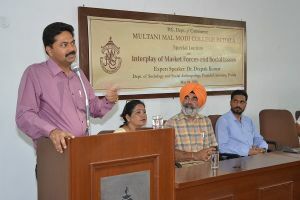 PG Dept of Commerce, M M Modi College, Patiala organized a special lecture on ‘Interplay of Market Forces and Social Issues’. Dr. Deepak Kumar, Dept. of Sociology and Social Anthropology, Punjabi University, Patiala was the guest speaker on the occasion. The college Principal Dr. Khushvinder Kumar welcomed the guest-speaker and spoke about the relevance of inter-disciplinary approach for the analysis of social and economic issues. Dr. Deepak Kumar explained the change in social relations due to the change in economy from agrarian to industrial one. He emphasized that the capitalism has redefined the value system, commodified human beings and believes in homogenization of the society. The study of interplay of market forces and social issues is must for comprehending the social phenomenon happening around us. He lamented that our present economic system makes use of rationality for legitimizing inequalities prevailing in the society. It is unfortunate that persons who try to have individualistic approach, different from what market forces want, are considered rebellious and are forced to toe the line of the market. Prof. Nirmal Singh, Dean Commerce Faculty, talked about the concept of synchronicity and said that this meeting of sociologists with the students of commerce will certainly prove to be a meaningful coincidence. Prof. Mrs. Neena Sareen conducted the stage and Prof. Sharwan Kumar presented the vote of thanks.